Throughout the year, you likely receive a significant amount of paperwork, some of which needs to be retained to prepare your tax return. Other documents may need to be retained to substantiate prior-year tax reporting. Maintaining your documents in an organized fashion will not only help you avoid missing valuable deductions to which you may be entitled, but will also help ensure that your income tax return is complete and accurate. If not, you can be out a lot of money in penalties and interest when errors are discovered. 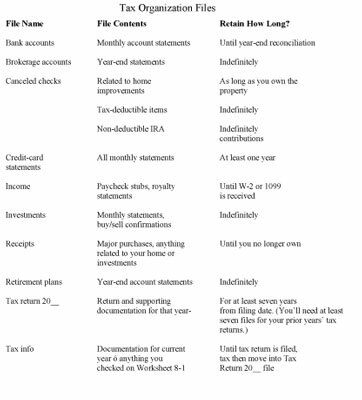 The following Tax Organization Files worksheet is a good organizational outline to help you keep your tax-related documents organized. The worksheet lists the ten main file folders you should create to keep your tax information organized and accessible. These files should be incorporated into your general household filing or record-keeping system. When tax time rolls around, all you have to do is pull out these files, and you’re ready to prepare your tax return. Click here to download and print the Tax Organization Files worksheet. If you pay bills online, print a confirmation statement and retain it in lieu of a canceled check. Maintaining efficiently organized and complete personal finance records helps you in so many ways. Not only can you avoid wasting time or stressing out when you can’t find important documents, but you can also avoid wasting money in late payment fees and additional interest charges, not to mention how much better you will feel should you get one of those wonderful audit notices in the mail from the IRS.